Welterweight Victor Ortiz (19-1-1, 14 KOs) came on late in the 10th round to knockout veteran Emmanuel Clottey (24-8, 14 KOs), the older brother of Joshua Clottey, on Thursday night at the Grand Plaza, in Houston, Texas. Clottey, 33, was knocked down twice in the tenth, before the referee Ronnie Halston swiftly moved in to put a stop to the bout at 2:59, with just a second to go in the tenth round. Up until then, Clottey had did little to distinguish himself in the fight, often throwing only a handful of punches each round while attempting to mostly avoid getting hit. He never seemed to get untracked during the fight, and only showed brief hints of the kind of talent that his younger brother, Joshua, posses. Clottey was hurt several times in the fight, the sixth, seventh and ninth rounds, by left hands from Ortiz. It’s surprising he wasn’t hurt more, given the lack of any real retaliation punches thrown by Clottey all fight long. On the rare occasions Clottey did decide to punch, Ortiz didn’t appear to like it much and gave him a lot of respect, perhaps too much in the end because the fight could have ended earlier if Ortiz had pushed himself. In the 10th round, Ortiz caught Clottey with a right hand as he was coming in, and hurt him bad, sending him to the canvas. Staggering as he got to his feet, it was only matter of time before Ortiz finished him off. After receiving a standing eight count, Ortiz quickly moved in and landed a left-right combination, followed by two pulverizing left hands that sent Clottey flying backwards where he landed on his back in the far corner. The referee then stopped the fight at 2:59 of the tenth round. Emmanuel Clottey (24-8, 14 KOs) with seconds to go in the 10th round on Thursday night at the Grand Plaza, in Houston, Texas. For the most part, the fight was a tiresome affair due to Clottey’s (the older brother of WBC # 5 ranked welterweight Joshua Clottey) reluctance to want to mix it up in any real meaningful way during the fight. In the early part of the fight, the 20-year old Ortiz did all the fighting, while Clottey attempted to slip punches and get in position to counter. Although known mostly as a counter puncher during his career, Clottey, 33, appeared unable (for whatever reason) to let his hands go even when Ortiz was wide open for punches. Round after round, the southpaw Ortiz landed jabs and straight left hands pretty much at will without even a hint of retaliation from Clottey. It was more like a sparring session than an actual fight, to be honestly. It was also strange because of Clottey’s close resemblance to his brother Joshua, who would have eaten Ortiz up with combinations and sent him packing early on. 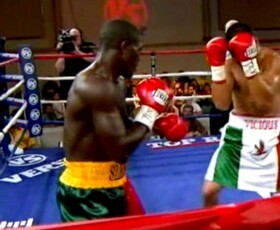 Ortiz staggered Clottey with a left hand shot in the sixth round. However, Clottey recovered well and remained an elusive target for the rest of the round.